Shavon was born and raised in Fort Myers. After attending college at Florida International University in Miami, she moved back here and began a career in Healthcare. She has been active in the field of Long Term Healthcare for many years. Shavon joined the Junior League of Fort Myers in the Fall of 2012 as a way to broaden her volunteer experience in Southwest Florida. She is excited to continue to oversee our League’s IBCI (Issue Based Community Impact) process. Past Junior League placements include: Research & Development, Special Events, and Community VP. Shavon is excited for all this league year has to offer! Jennifer Dooley moved to SWFL 7 years ago from Portland, OR to be closer to family. She joined the Junior League in the Fall of 2014 with the goal of connecting with our community and pursing her passion for volunteerism. She has served on Arrangements, DIAD, as a committee member and Chair, and has served on Board as Recording Secretary and Community VP. Jennifer loves getting out in the community and participating in the events that JLFM puts on. She says, “Doing good for others drives me to keep doing good!” Jennifer has worked at Chico’s FAS for 6 years. In her free time she enjoys cooking, baking, traveling, and spending time with friends and family. She is honored to take on the role of President Elect, and be on the path to become President of our amazing league! She believes in the mission of Junior League and especially in developing the potential of women. Being a part of the Junior League of Fort Myers has taught her so much, and she is excited to take on this new role, and prepare for next year! Kate moved to the area in 2014 and was attracted to Junior League as a way to meet new people and get involved in her new community. Since joining, she has served on the Communications committee and Membership Development. Kate says she has really enjoyed meeting all the new provisionals through Membership Development and was able to serve as the assistant chair and chair for the past two years. Kate is interested in the Membership VP role to help shape how we support our current members and continue to recruit new members in our growing community. Outside of Junior League, Kate is a marketing manager for a speech analytics company and also serves on the Board of Directors for the Edison Festival of Light. She lives in Fort Myers with her husband, Dan, and adorable black lab/pit bull mix, Buddy. KATE loves book clubs and the beach, especially when combined. Audra is a Colorado native who relocated to Florida for school (and the beach!). She attended Stetson University and the University of Miami School of Law. Audra is married with two furbabies and is expecting her first daughter in March. She moved to Fort Myers two years ago and works for the Florida Attorney General’s Office of Statewide Prosecution. 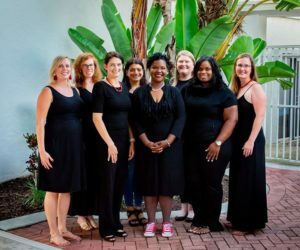 Audra joined the Junior League of Fort Myers in 2016. She is the current 2017-2018 Advisory Planning Chair. With a keen interest in contributing to the community in Lee County, Erin joined the Junior League of Fort Myer’s Spring 2017 provisional class. As a provisional member, she discovered that her passion for voluntarism and leadership had found a home. As an active member, Erin has been fortunate to serve the league as Chair of Done in a Day for the 2017- 2018 league year. During this time, she has additionally sought out other opportunities to contribute to the league such as assisting with the permitting process for the 2017 Taste of the Town. Erin brings a background composed of finance, entrepreneurship, events and the arts. Over the years, she has contributed to the arts community as a professional dancer and choreographer, while working in the events industry; however, more recently she has focused on entrepreneurship. Erin is grateful to serve as Recording Secretary in the upcoming league year and is looking forward to all the connections, impact and growth that the league year will hold for us in 2018-2019. Lesley was born and raised in Fort Myers. She is married and enjoys a career as a corporate attorney for The Hertz Corporation located in Estero. Lesley joined the Junior League of Fort Myers in the Fall of 2014 as a way to give back to her community. She looks forward to working with fellow board members to serve the League this year. Anita Duenas is in her 12th year of active membership in the Junior League. She has served on each council, and has served on the League’s Board as Advisory Planning Chair, Communications VP, Membership VP, President-Elect and President (2013-2014). Anita is also a past-President of the Board of the SWFL Healthy Start Coalition and is currently Vice President of the Children’s Advocacy Center Board of Directors. Anita is excited to use her leadership experience to help bring new leaders forward and help build League capacity Anita earned her BS in Communications and works a Business Systems Analyst at Cision Inc for past 24 years. Anita enjoys all aspects of the arts, and enjoys painting and photography in her spare time, along with attending concerts and Broadway shows. She also loves technology and gadgets, travel and spending time with family and friends.